Millennials have grown up in an age where they get constant stimulation from the games they play – video games, the Internet, and now on phone games. They want more than to watch idly as the slots spin towards their predetermined outcome. They want control of, or at very least the ability to contribute to the outcome, and they want to have fun doing so. The solution for attracting millennials may be the new wave of skill-based games coming to casino floors. As with all pioneering products, not everyone gets it right on the first try. We both (Cory is 26 and Mitch is 23) spent an entire day testing many of the skill-based games on the G2E floor. We came away with some conclusions that might help companies understand what millennials really want. Our first conclusion came after pushing the slot button on Scientific Games’ Space Invaders ten times and having to use the service menu to get to the skill-based bonus round: we wanted the skill-based portion to appear first. 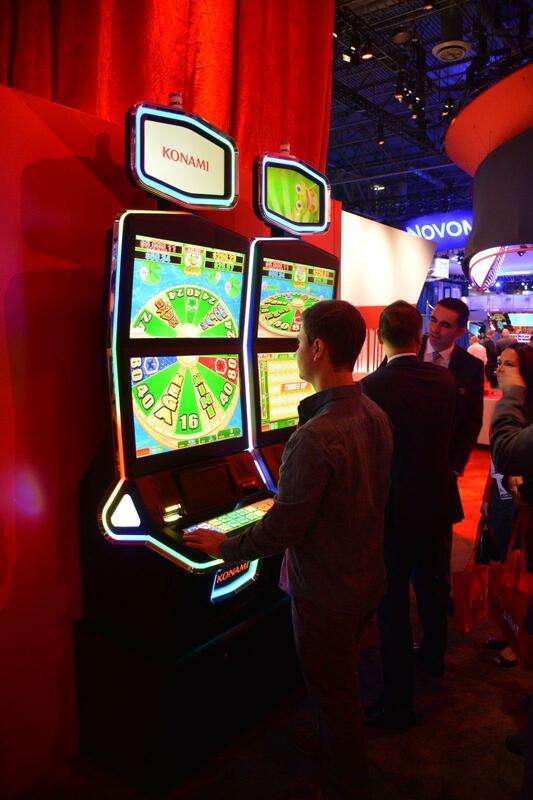 When three bonus symbols appear on the reels, the player has the chance to play a skill game to win extra money. Both of us lost patience during the initial slots play. On a casino floor we might not have even realized the game had a skill-based aspect. We didn’t know if we had five more spins to get to the bonus round or twenty. Gamblit has a very similar system to Konami for payouts. In Catapult King, the player sets their bet and takes aim at the castle with their siege weapon. For each guard the player knocks down, a random number generator determines the payout. Since a player pays for each ball, the more guards a player knocks down with one ball equals a better average payout. 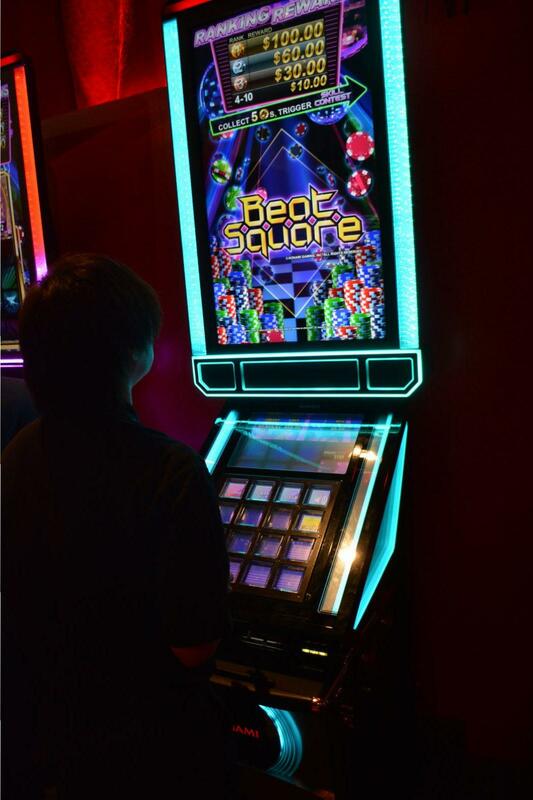 As we stated before, millennials are easier to get bored by repetition, and Gamblit’s way of combatting this is to have a machine with six different games to choose from. We didn’t encounter this feature anywhere else. Gamblit readily admits that their games are “inspired” by many of the games millennials already play. Smoothie Blast was nearly identical to Candy Crush and Catapult King reminded Cory of Boom Blox. One big difference between the Konami and Gamblit machines was the controls for their games. Konami used physical buttons for controls, while Gamblit’s multi-game machines were 100% touch-screen controlled. 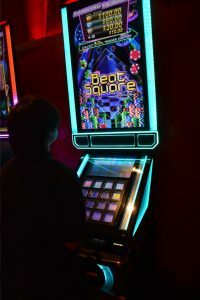 We found that the touch screen made the games harder to play, especially in games that depended on the player’s reaction time. At another booth, we played a game that used two tiny joysticks; one to control the movement of a character and the other the gun they were holding. We had a hard time playing the game sober, so it’s difficult to imagine an inebriated player being very successful. We both agreed that control frustration would make us less likely to play in the future. It’s not surprising that Konami found the better approach for controls, given their nearly 40 years of experience in arcade games. One major theme of the skill-based games we tested, from various vendors, was the similarity to top-selling phone games such as Candy Crush and Bejeweled. Cory had mixed feelings on this aspect. He felt that it wasn’t creative for these companies to be building off already popular games and transforming them into betting games. Mitch thought that the similarity between the games reduced the learning curve for players. He has played Candy Crush on his phone and found instant success at Smoothie Blast. Similarities can also bring back great memories of a game the player used to play, but got tired of; a player might enjoy a fresh take on that game. A downside to using variants of popular games is that these games are often complex, which can cause the payout structure to be very confusing. On some games, we weren’t sure how well we were doing while playing, and the game ending came when we weren’t expecting it. One unique game we found, Lucky’s Quest by IGT, allowed a player to play on their phone both at the casino and at home. In the game, the player has “pets” that give special power-ups. Playing at home, the ability to gamble real money is lost, but the player can level up their pet to make the power-ups even stronger. When the player brings their phone to the casino, they can use these pets to boost their earnings whether they play on their phone or transfer them to the machine version of the game Psychologically, this can get players to feel as though they have more control over outcomes because they have an advantage relative to other players. Additionally, they can practice the game at home, so they feel prepared to tackle it while at the casino. We found the idea of giving players a chance to practice before playing for money a very good one. A traditional slot machine doesn’t have a learning curve – even if there are bonuses and multipliers, the player’s knowledge of them doesn’t affect the outcome. For skill-based games, the player needs some encouragement that they won’t die or lose before they have a reasonable understanding of the game. Konami also did a great job of this in their Dance Dance Revolution rhythm game, which gives the player a practice session before the actual game commenced with the option for veteran players to skip right over it. 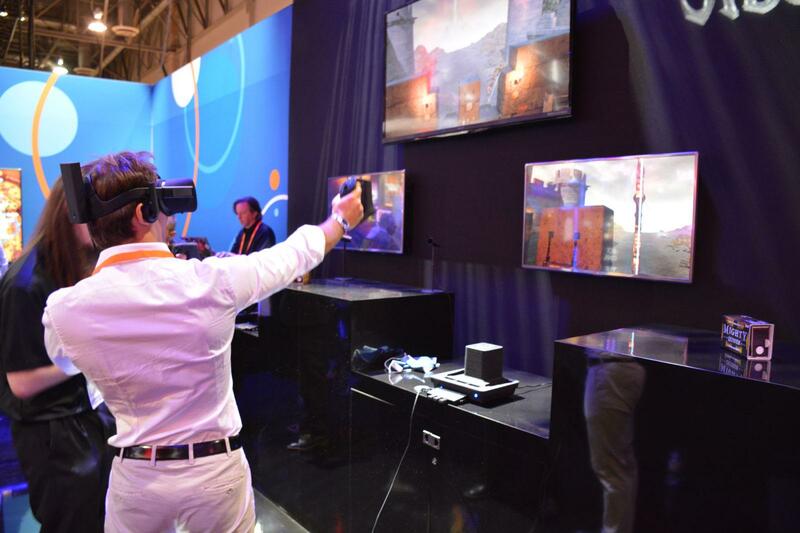 A new category of games that we believe will attract millennials is virtual reality. Virtual reality involves putting on a fancy headset that totally changes the world in front of the player. When we put on the VR headset at Siege VR at the IGT booth, the slots machines behind us became a castle wall. We noted four ways that casinos might monetize virtual reality. The first is a simple pay-to-play scheme, a flat fee for the enjoyment of the experience. While that could take place anywhere, not just at a casino, it could be an appealing option to the risk-averse who still want to have fun at a casino. The next way we noticed, seen in the zombie VR game in Gamblit’s booth, was to have the virtual reality experience alongside in-game objectives the player completes to gain higher payouts The third way is a tournament where prizes are awarded to the top players. We felt this system would work especially well with Siege VR where the player is an archer on top of a castle and must shoot arrows at invaders. Mitch, an avid poker player, felt it would be a similar experience to a poker tournament, allowing the casino to take a cut while the top players still consistently make money. The fourth way is having player vs player, either one-on-one or two-on-two, where the winners take what the losers have wagered, minus the house cut. This competitive aspect of gaming would give people the feeling that they aren’t losing to the house, but to other players. In general, we felt that the multi-player concept was much more appealing to millennials for this very reason and could be applied to other skill-based games, not just virtual reality. 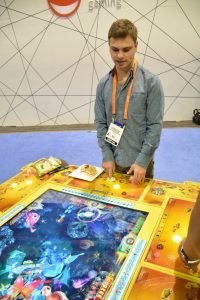 One such game we encountered, from Fish Games USA, involves a large table about eight feet across. There is a large screen in the middle of the table, allowing up to six players to join in the fish-shooting action. Each bullet the player fires costs a certain amount and every fish the player destroys gives a different reward depending on the number of bullets required to destroy it. Another game, Running Rich Racing from Competition Interactive, had four racing cabinets side-by-side with players pitted against each other. While the players themselves have the opportunity to earn money, spectators can also join the action by betting using the touch screen behind each player. Both games have the potential to get very competitive and can also be a great social experience – two things that millennials seek out. After spending time with the first generation of millennial-targeted skill-based machines, we felt that Konami had the most polished experience. Both of its games had excellent controls, easy-to-understand but difficult-to-master concepts, and a clear display of how the player was progressing through the game and where their money was going. We wanted to play more.